Small wonder that, at nine years old, Monica Holloway develops a fascination with the local funeral home. With a father who drives his Ford pickup with a Kodak movie camera sitting shotgun just in case he sees an accident, and whose home movies feature more footage of disasters than of his children, Monica is primed to become a morbid child. Yet in spite of her father's bouts of violence and abuse, her mother's selfishness and prim denial, and her siblings' personal battles and betrayals, Monica never succumbs to despair. Instead, she forges her own way, thriving at school and becoming fast friends with Julie Kilner, whose father is the town mortician. She and Julie prefer the casket showroom, where they take turns lying in their favorite coffins, to the parks and grassy backyards in her hometown of Elk Grove, Ohio. In time, Monica and Julie get a job driving the company hearse to pick up bodies at the airport, yet even Monica's growing independence can't protect her from her parents' irresponsibility, and from the feeling that she simply does not deserve to be safe. Little does she know, as she finally strikes out on her own, that her parents' biggest betrayal has yet to be revealed. Throughout this remarkable memoir of her dysfunctional, eccentric, and wholly unforgettable family, Monica Holloway's prose shines with humor, clear-eyed grace, and an uncommon sense of resilience. Driving with Dead People is an extraordinary real-life tale with a wonderfully observant and resourceful heroine. 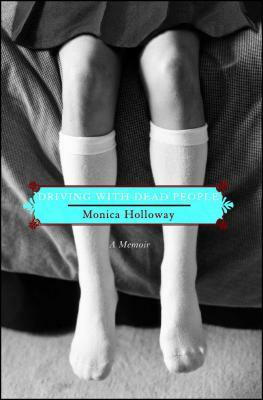 Monica Holloway is the critically acclaimed author of the memoir Driving with Dead People. She has contributed to the anthology Mommy Wars, from which her essay "Red Boots and Cole Haans" was described by Newsday as "brilliant, grimly hilarious." She lives in Los Angeles with her family. "Memoir, at its best, opens my heart and gives me a view into the core perfection of another. Monica does this in the most essential way, going directly to perfect storytelling laced with irony and humor. She held my heart with her raw, unapologetic honesty, and she flawlessly rendered what it is like to be a child who sees everything, endures it, and still loves with her whole being." "A meticulously reported account of one girl's journey through a violent and unpredictable childhood. Holloway's strong voice and remarkable sense of humor, in spite of the horror in her past, make this an unforgettable read." "Joining searing childhood memoirs such as The Glass Castle and Running with Scissors comes the impressive Driving with Dead People, a fascinating, gritty, hilarious read for everyone who realized as a child -- as Monica Holloway did -- that 'we were the weird ones.' Holloway narrates her sad, funny childhood with an exquisite blend of raw honesty, deadpan wit, and compassion for her family -- and herself." "Driving with Dead People is a heartbreaking, hilarious, and page-turning read. In the space of one sentence Monica Holloway can break your heart and make you laugh out loud at the same time. Her memoir has the momentum of a good mystery novel -- the kind you stay up all night reading to find out what happens to the heroine, because you love her so much. This is a stunning debut of a writer who deals with difficult material and makes it fresh and moving." The first story Monica tells is of reading about Sarah Keeler's death and attending her funeral. Why do you think, as she says in the first sentence, that this "changes everything"? How does it set the stage for the rest of the memoir? Monica's dad loves recording other people's disasters, and creating disastrous circumstances for his family. What did you make of his odd hobby? What about his penchant for violence and putting his family at risk? Do you think there's a link? Discuss Monica's mother. Monica describes her as "a human cork; she floated to the top of any awful situation". What are some examples that support her description? Are there any instances when her mother behaves differently? Did your opinion of her mother change at all over the course of the book? Monica is in an almost constant state of anxiety. What are the physical effects of her fear and uncertainty? What effects are less obvious? In order to protect herself, and because she is left to her own devices, Monica learns early on to be a close observer and to draw her own conclusions. How do those skills influence her writing? What nuances or details might be different if she had been a less attentive, and perhaps happier, child? Monica's childhood and adolescence are punctuated with death and she is both attracted to and frightened by it. What does she learn about herself when confronted with the possibility of death? Why does she like to imagine being dead? Is her reaction to Wendy Johnson's death different from her reaction to Sarah Keeler's? The Kilner household (and funeral home) becomes a haven for Monica -- a home away from home. What does their family -- especially Julie and Dave -- offer her? How do they influence her? "While Joann made me feel challenged and excited," Monica writes, "with Becky I always felt comforted...Becky felt like an extension of me". Describe the relationship Monica has with each of her sisters. How does each relationship evolve? Why do Becky and Monica grow apart in high school, at a time when they need each other most? How does JoAnn take over that role in Monica's life? Monica becomes a talented actor early in high school and she pursues it through college and into a career. What attracts her to acting? How do you think her childhood experience might help to make her an especially gifted performer? Given that their family life was so harrowing, one might assume that when the Petersons divorced Monica's home life would improve. Is that the case? How does Monica's mother act after the divorce? How does her father? Were you surprised? Discuss Monica's relationships with men. Is there a pattern in the type of man she gravitates to? Do you think it would ever have been possible for her to have a fulfilling relationship with a man before she remembered and dealt with her sexual abuse? The trauma of their childhood affects all of the Peterson children, but it propels them in different directions as they grow older. How does it shape each of their adult lives and choices? Did their ways of coping as adults change or remain the same from when they were young? Were you surprised when, as an adult, Monica grew close to her father? Why do you think this occurred when it did? Do you think that closeness made it harder or easier for her when she discovers what he did to her and JoAnn? Although she intends to confront him about JoAnn's molestation, ultimately she "let him go without words". What do you think of that choice? When JoAnn's therapist suggests her mother is culpable, Monica is "incensed". Yet her mother's denial and some of Monica's memories make her question what her mother knew. Do you think that she was aware of the abuse? Monica's childhood is colored by two tragedies -- physical and sexual abuse, and neglect and betrayal. Is one more damaging than the other? After reading Driving with Dead People, do you think that her parents genuinely loved her? Do you think she continues to love them? What character traits -- both good and bad -- do you think that Monica developed as a result of her early years? How do you think those traits shaped Monica's life? Monica is a character in her own book, as well as its author, but Driving with Dead People documents the experiences of her whole family. In writing a memoir an author strives to be as accurate as possible, but must rely on her own recollections. How might the memories of other members of her family differ from Monica's own? Do you think she presents an objective portrait of the Petersons? Discuss how she handles writing from JoAnn's perspective in part five of the book. Why do you think Monica chose to write her story and share it? Which parts were the most difficult to read and which did you enjoy the most? Discuss her writing style and how she confronts the most sensitive and personal parts of her past.